As with most of my Field Test Shooting videos, I usually do a bit of a pre test to make sure the gun is functioning properly and so I shot a full magazine of my brass shells through the ASG CZ 75 and it worked like a charm, of course when I started recording the live video it decided not to work at all and I still do not know why? I was able to revert back to the plastic shell casing that came with my ASG CZ 75 Blowback Shell Ejecting Airsoft Pistol and they seemed to be working so I went with them for my testing. Interestingly enough the brass shells got much higher fps (around 300+) when I did my pretest compared to around the 250 average fps I was getting with the plastic shell casings. Shooting on target proved to be better than I though once I raised my sight point up a bit, the gun likes to shoot a bit low but once I found the sweet spot I got three rounds within about 3/4 of an inch from just over 20 feet away in a semi rested position. 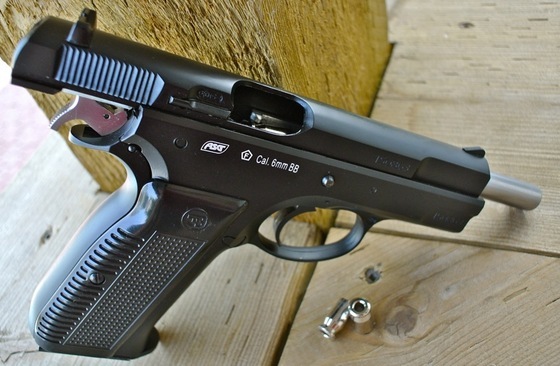 Make sure to watch my Table Top Video Review for information and photos on the ASG CZ 75.